It’s always fun to read the ads in old newspapers, but one in particular that I came across recently really caught my attention. My friend Pat Wishart invited me to her home this past summer to look at some old newspapers from December, 1941–January, 1942. These papers, of course, were saved because of the news regarding Pearl Harbor. 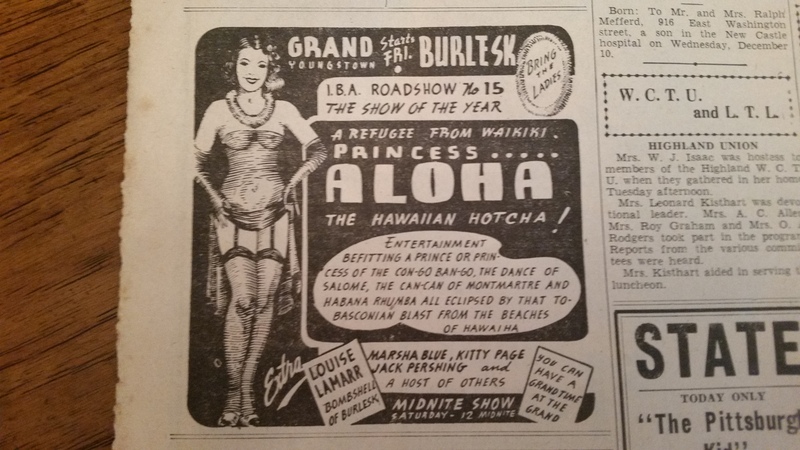 As proof, I suppose that Life goes on or that young ladies still had to make a living, there appeared an ad, pictured below, for “Princess Aloha, the Hawaiian Hotcha” who was making her appearance at the Grand in Youngstown, Ohio. According to the ad, the poor princess was a “refugee from Waikiki.” Several other performance artists (my term) were also on the bill which was “I.B.A. Roadshow No. 15, the Show of the Year.” A cursory search of the Internet reveals nothing about the “I.B.A.”—at least I’m assuming that it has nothing to do with the Irish Brokers Association or the International Bar Association. My guess is that those initials stood for “International Burlesque Association,” about which I would love to know more. It’s a fascinating ad, and rather racy it seems to me for a local newspaper, even if it does urge readers to “bring the ladies.” Perhaps the most fascinating thing is the timing. I’m assuming that Princess Aloha was not really a refugee from Waikiki, but even if she was, this must have been her act for months if not years, and it was not intended to take advantage of the tragic news from Hawaii. Indeed, I wonder how her act did play in the days following Pearl Harbor? And I wonder what became of Princess Aloha. Did she trade the stage for the factory floor and become one of the many Rosie the Riveters? Did she join the WACS or the WAVES or become a nurse? Or did she go on boosting morale in the best way she knew how? Ah, Princess Aloha. You have aroused my curiousity, and not concerning what may have been underneath your palm leaves, but rather what became of you after “I.B.A. Roadshow No. 15, The Show of the Year,” played in Youngstown, Ohio. This entry was posted in Life is Interesting, World War II and tagged Grand Theater Youngstown Ohio. burlesque, I.B.A. Roadshow, Princess Aloha. Bookmark the permalink.